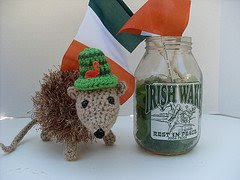 Paddy O'Possum may like a little of the irish coffee, but this is one fluffy fur pattern that won't have you hitting the bottle for St Patrick's Day. Change the colour of Paddy's hat to make him a Christmas o'possum, but just don't call him a rat. It kind of upsets him. You blog is very interesting. It's just my way of keeping up with all the gorgeous amigurumi patterns out there, since I don't have the time to make them all!